Aromatherapy has been used for thousands of years as medicines with healing properties. However, now a days we know a lot more about the different types of essential oils and how they can be used to improve physical and emotional health and restore balance to the whole body. 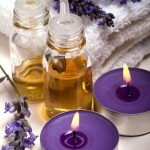 Aromatherapy is an alternative medicine that is categorized under herbal medicine. Unlike herbal medicine, aromatherapy herbs are not taken internally; rather essential oils are inhaled or applied to the skin. When using essential oils proper ingredients, dilutions and preparations are vital to the efficacy of aromatherapy. 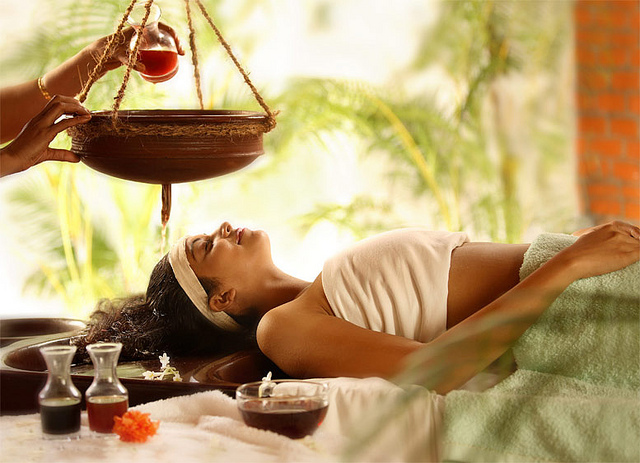 Essential Oils And Ayurveda can be used in several techniques such as massage, baths, steam inhalations, vaporizers, creams, lotions, shampoos, gels, gargles, mouthwashes and hot or cold compresses. Determining the appropriate essential oil (as well as a carrier oil if being applied directly to the skin) for your symptoms or illness is required. If you are unsure about what you are doing its best to contact a local aroma therapist to help you with your therapy. Each essential oil has its own healing properties and aromas. 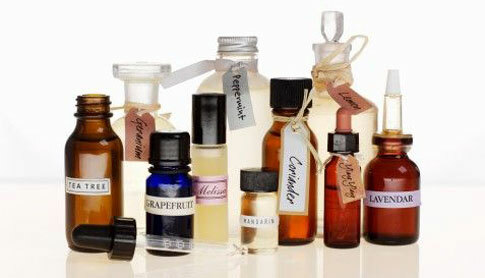 Everyone appeals to different scents therefore not all essential oils will work for every individual. 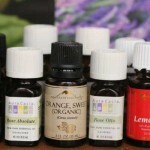 Below is a list of the top 10 essential oils used in aromatherapy. Peppermint– Peppermint is best known for its remedy for digestive problems such as slow digestion, indigestion, diarrhea, nausea and flatulence. It is refreshing and stimulating for the liver, intestines and nervous system. As a painkiller it can treat headaches, toothaches and muscle aches. Eucalyptus -Eucalyptus is a powerful decongestant treatment for respiratory problems such as coughs, colds, asthma, chest infections, and sinusitis. It alleviates inflammation, reduces fever, treats skin infections, and eases pain of burns. It relieves muscle tension, treats rheumatism, and fibrositis. It boosts the immune system, which stimulates new tissue formation, and diuretic capabilities. Ylang Ylang– Ylang ylang is a sedative, antidepressant, and tonic for the nervous system. It treats depression, anxiety, tension, irritability, and stress related insomnia. It regulates the circulatory system and rebalances body function such as reducing blood pressure and slowing down breathing and heart rate. Geranium– Geranium is generally regarded as a feminine oil because it balances women’s hormones. It also can treat PMS and menopausal problems Geranium is relaxing, refreshing and uplifting and alleviates the symptoms of apathy, anxiety, stress, hyperactivity and depression. As an anti-inflammatory and astringent it balances the skin and can relieve acne, diaper rash, burns, blisters, eczema, cuts and congested pores. Lavender– Lavender is a calming, soothing, relaxing antidepressant. It is an antiseptic, antibacterial, and painkiller when treating cuts, wounds, burns, bruises, spots, allergies, insect bites, and throat infections. Lavender has a balancing effect, which lowers blood pressure, eases digestive spasms, nausea and indigestion. Lavender can treat tension, depression, insomnia, headaches, stress and hypertension. Lemon– Lemon stimulates the body to fight infections, and treats inflamed gums, mouth ulcers, sore throats, and acne. Lemon fights against colds, flu, and bronchitis. Lemon oil is a diuretic, laxative, and astringent. Its aromatic smell uplifts the mood and relaxes the nerves as well as dispels depression, indecision, and anxiety. It can also be used as a deodorizer and for house cleaning. Tea Tree– Tea tree oil is full of healing properties because its an anti fungal, antiviral, and antibacterial. Tea tree is used in several skin problems such as spots, acne, warts, verrucae, athlete’s foot, rashes, insect bites, burns and blisters. It can be used to clean cuts and infections, wounds, and helps in process of healing scar tissue. Tea tree boosts the immune system and alleviates inflammation. It fights against colds, flu, respiratory infections, and infectious illnesses. It promotes relaxation to help fall asleep and balances hormones in the body. Roman Chamomile– Chamomile is calming, relaxing, oil that helps with sleeplessness, anxiety, muscle aches, tension and stress. It is a valuable anti-inflammatory, antiseptic and antibacterial. Chamomile can treat skin problems such as rashes, boils, allergies, insect bites, wounds, cuts and infections. In addition chamomile can relieve pain, headaches, toothaches, menstrual cramps, arthritis, neuralgia, indigestion, nausea, and flatulence. Rosemary– Rosemary is a refreshing and stimulating oil. It stimulates mental capacity, immune function, blood circulation and the digestive system. It is a tonic to the nervous system and acts like an antidepressant. It can relieve stress related disorders, and mental exhaustion. As an antiseptic, antibacterial, anti fungal, and diuretic it can cleanse the body and relieve pain. For digestive problems it can relieve digestive spasms, flatulence, indigestion, and constipation.